It's now almost as popular as the student-favorite introductory economics course. “Introduction to Economics” has long been one of the most popular courses among Harvard undergraduates. Now it has more competition. 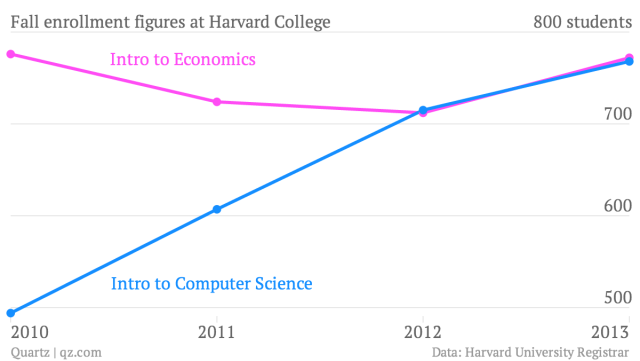 In the last two years, “Introduction to Computer Science” has caught right up as students at the Ivy League school increasingly value a background in programming. Preliminary data (pdf) released by Harvard—and first reported by the campus newspaper—show the courses are neck and neck. In the current semester, 772 students are enrolled in the introductory economics course taught by Greg Mankiw, who served in the George W. Bush administration. The computer science course, taught by David Malan, has 768 students. The number of students majoring in computer science is growing, too, but still trails much more popular majors like economics and government.